This spring when I went out to check our bee hives we had lost 6 of them due to the early warm spell followed by the snow and cold snap. In order not to loose all these hives we ordered 6 new queens to try and build our hives back up. 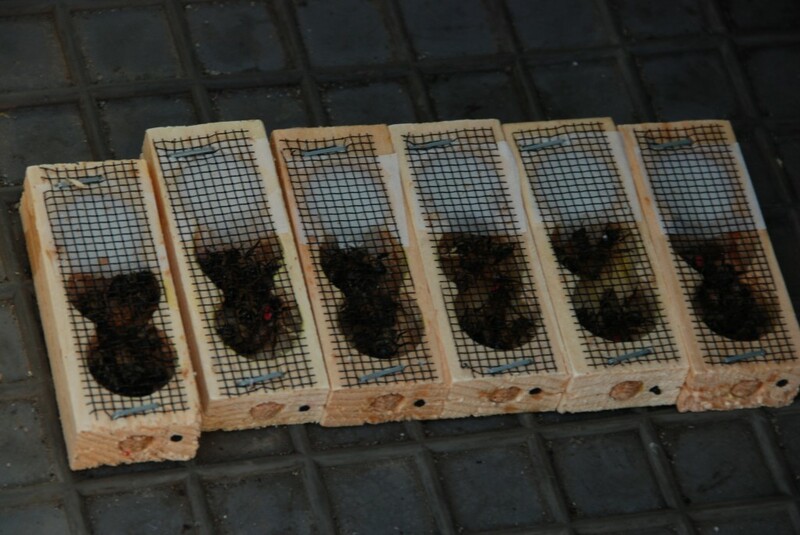 Today the 6 new queens arrived and I split 6 of the strongest hives. If it goes as planned we will have 6 new hives in a week. Each queen was shipped with several attendants and a candy plug. To make the splits I removed a few frames that were full of bees from strong hives and put them into empty boxes. The bees on the frames will eat the candy plug from the queen box, during the days that it takes them to do this the bees will get used to the smell of the new queen and not kill her which would happen if she was introduced immediately. This entry was posted in Uncategorized and tagged bees, hive, honey, queen. Bookmark the permalink.